George Groom was born in 1933 in Stewartsville, Missouri. He enlisted in the U.S. Army on March 26, 1951, and was trained as an infantryman. Groom served with 2nd Battalion of the 27th Infantry Division during the Korean War from August 1951 to August 1952. After Korea, he served as a Combat Engineer in West Germany from November 1952 to February 1954. 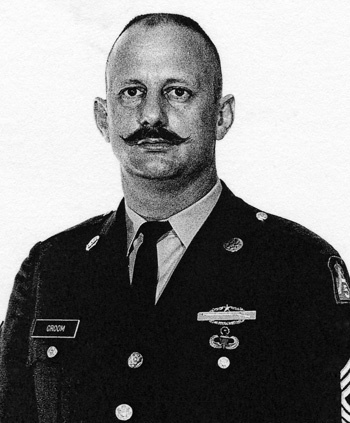 Groom then served as a Combat Engineer at Fort Knox, Kentucky, and Fort Gordon, Georgia, before serving as a Military Policeman at Fort Gordon, from December 1955 to August 1956. He then served as a Supply Specialist and Ammunition Storage Specialist, serving at Fort Gordon and then in West Germany from May 1957 to May 1960. 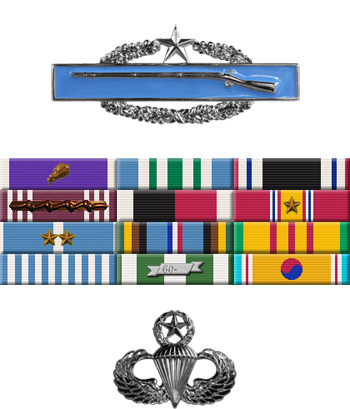 He served as an Artillery Gunner at Fort Bragg, North Carolina, from June 1960 to May 1961, and then trained as an Infantry Operations and Intelligence Specialist and Radio Operator, serving with the Special Forces on Okinawa and then with the Military Assistance Advisory Group in the Republic of Vietnam from December 1961 to March 1963. During this time, Sgt Groom was captured by Viet Cong forces in South Vietnam and was held as a Prisoner of War for 24 days, from April 8, 1962, to May 1, 1962. He then served with 1st Special Forces at Fort Bragg from March 1963 to July 1966, when he went to Taiwan to serve with the Military Assistance Advisory Group there. Sgt Groom returned to the U.S. in May 1968 and served at Fort Sheridan, Illinois, until May 1969. He served with the Military Assistance Advisory Group in Iran from May 1969 to May 1970, and then as an Intelligence Sergeant at Fort Knox, Kentucky, from May 1970 until his retirement from the Army on January 31, 1973.